All of the preseason hype surrounding Class 6A was related to the talent that would be featured on the Derby Panthers’ sidelines. After the season’s opening night, the Panthers had been upset by Salina South in a game where South really dictated the tempo and style of play. A few weeks later, Derby is back on top of the state’s largest classification thanks to what has been a revolving door atop the 6A rankings. Only one team remains unbeaten in the classification; the Topeka High Trojans. Topeka, coming off of its best season in school history, only returned a handful of starters on each side of the ball. But the Trojans have remained unbeaten heading into a district where the four teams are a combined 20-4. Topeka begins district play at 5-1 Manhattan. Hutchinson, the dominant team over the past several season, has battled a number of injuries and sits at just 3-3 entering district play. Given the improvement of district foes Maize, Garden City, and Dodge City, many are wondering if the Salthawks will be a part of the playoffs this season. Lawrence Free State (5-1) – The Firebirds would likely be the No. 1 team in the state if not for a 26-19 loss to Olathe North in Week 5. Joe Dineen leads the Firebirds on both sides of the ball. The Kansas-commit has passed for nearly 900 yards and 12 touchdowns and has rushed for nearly 450 yards and five scores. Free State has a legitimate shot at representing the Sunflower League in the 6A state title game. KC Wyandotte (3-3) – Dimonic McKinzy is an exceptional athlete for Wyandotte. The Minnesota-commit has thrown for 1,631 yards and eight touchdowns and rushed for more than 300 yards and eight more scores. Antonio Moore is averaging more than nine yards per carry and has totaled 580 yards and eight touchdowns. Junior Stephen Ford is the Bulldogs leading receiver with 26 receptions for 603 yards and five scores. Lawrence (2-4) – Lawrence’s four losses have come to strong Sunflower League opponents that are a combined 16-8. The Lions advanced to the second-round of the playoffs last season before falling to eventual champion SM West by a touchdown. The Lions feature Drew Green at running back who has rushed for nearly 500 yards . Leavenworth (2-4) – Leavenworth has a chance to get back to the playoffs after a year absence. The Pioneers are led by senior running back Jason Randall who has rushed for 905 yards and nine touchdowns. Quarterback Landry Hodges has passed for 479 yards and three scores this season. Shawnee Mission East (5-1) – Former Emporia coach Dustin Delaney has had a nice start to his career at Shawnee Mission East. The Lancers opened the season 5-0 before last week’s 17-10 loss to Lawrence Free State. Christian Blessen has passed for 603 yards and six touchdowns. Luke Taylor has rushed for 801 yards and five touchdowns. The Lancers have made the playoffs in each of the past four seasons. Shawnee Mission West (3-3) – The defending state champion Vikings enter districts on a three-game losing streak and are coping with the tragic death of wide receiver Andre Maloney. The Kansas Jayhawks recruit died Friday, Oct. 4 after suffering a stroke during a game a day earlier. Shawnee Mission West quarterback A.J. Verdini has passed for 928 yards and seven touchdowns. The Vikings have made the playoffs every year dating back to 2008. Shawnee Mission Northwest (1-5) – The Cougars’ only victory was a 42-21 win over Leavenworth. Four of the Cougars’ five losses have been by fewer than 10 points. Devin Shockley leads Shawnee Mission Northwest with 101 tackles. The Cougars failed to make the playoffs in 2012 after advancing to the postseason in each of the two previous seasons. Shawnee Mission North (0-6) – The Indians have struggled in veteran coach Don Simmons’ first season directing the team. North has scored only 51 points all season while allowing 279. Quarterback Will Schneider has passed for 627 yards and four touchdowns. Nick Perez has 453 yards and four touchdowns. The Indians are on a 16-game losing streak that dates back to 2011. Key Game: (Week 8) SM West at SM East should decide both spots. Blue Valley Northwest (4-2) – The Huskies are a scary team in this district. Northwest has beaten the likes of Blue Valley, Blue Valley West and Aquinas, while losing only to Gardner-Edgerton and Miege. Jake Rominger is a solid quarterback and he has pieces around him with running back Miles Alexander and wideout Jaquwan Stone. Olathe East (4-2) –All the Hawks seem to do is win under coach Jeff Meyers. Olathe East is trying for its 11th consecutive playoff appearance this fall. Connor Leach has passed for nearly 650 yards and 11 touchdowns this season, while Jalen Branson leads the ground attack with 470 yards and five scores. Jordan Brown has chipped in nearly 450 yards and five more scores for Olathe East. Shawnee Mission South (3-3) – SM South is a much improved program under Ryan Longeran. The Raiders have dropped two games by a touchdown or less. Ra’Keim Abdul has been a little banged up and they’ll need him healthy to earn a playoff spot in this district. Abdul has rushed for more than 500 yards and three scores and is just a bother to opposing quarterbacks in the defensive secondary. Blue Valley North (0-6) – There’s not a lot to like about this season for the Mustangs. Blue Valley North has dropped its first six games by an average of 37 points per game. Gardner-Edgerton (5-1) – When you talk about Gardner-Edgerton is hard not to mention Traevohn Wrench. The senior running back has already rushed for 1,420 yards and 18 touchdowns while averaging more than nine yards per carry. Slow down Wrench, and you have a chance to win, but Jared Hobby has thrown for nearly 950 yards and 12 scores this season. Olathe North (4-2) – The Eagles are a young but extremely talented team. Their two losses have come by a combined four points. Venus Triplett is emerging as a big-time back with 816 rushing yards and 12 touchdowns this season. Tight-end Josh Moore is a match-up problem for opposing defenses at 6-foot-5 and 255-pounds. The Eagles may be a year away, but they are talented enough to make a run at the title this season. Olathe South (4-2) – With the state’s most sought-after recruit playing on its side, Olathe South is seeking to get back to the postseason after a one-year absence. The Falcons last reached the playoffs when they finished as 6A state champs in 2011. This season it will be up to the running game and the play-making ability of quarterback Jake Seurer who has passed for nearly 500 yards and seven scores. Olathe Northwest (3-3) – Chip Sherman’s first season at Olathe Northwest has been up and down. The Ravens have won two straight after a three-game losing streak that included a heartbreaking 27-22 loss to SM East on the game’s final play. Cody Sestrich has led the Ravens with 500 yards rushing and four touchdowns, while quarterback Cole Dahlquist has thrown for an equal amount and four scores. Key Games: All games are pivotal in what should be a really competitive district. Topeka High (6-0) – The Trojans are compiling 419 yards of offense with 244 on the ground and 175 through the air. Alec Beatty leads the Topeka offense with 957 passing yards and 674 rushing yards. The Trojans will eye another playoff run after advancing to the second round last year. Manhattan (5-1) – The Indians opened the season with a loss to 5A’s Mill Valley, but has bounced back with five consecutive wins over Centennial League schools. The Indians have allowed only 66 points all season. Manhattan has made the playoffs in each of the past five seasons. Washburn Rural (5-1) – The Junior Blues’ only loss came in the season opener against Blue Valley West. Since then, former Rossville head coach Steve Buhler has directed to the Junior Blues to five straight wins. Quarterback Blake Peterson has more than 1,000 yards of total offense. Washburn Rural has made the playoffs only once in the past 10 seasons. Junction City (4-2) – The Blue Jays have won four straight since opening the season with losses to Hays and Topeka Seaman. Junction City’s two losses were by six points combined. The Blue Jays won the state championship in 2008 but has made the playoffs only one time since then. Key games: Every game will be crucial in a district that has only four losses between four teams. Derby (5-1) – Derby has won five straight after a season-opening 42-35 loss to Salina South. The Panthers rank No. 1 in scoring offense and No. 2 in scoring defense in Class 6A with a combined score of 268-82. Quarterback Jeremy Dunham has rushed 87 times for 492 yards and has completed 42 of 60 passes for 809 yards. His 70 percent completion rate leads AVCTL Division I. De’Andre Goolsby has hauled in 22 catches for 343 yards. Wichita Heights (4-2) – Heights has three players between 329 and 408 rushing yards, led by 62 carries for 408 yards from Darvin Batiste. Heights has outscored opponents 174-84 and is one of eight 6A teams that has allowed less than 100 points. Wichita East (2-4) – Deonta Thomas stands second in the City League with 106 carries for 525 yards, while quarterback George Bousfield has completed 12 of 41 passes for 185 yards and three scores. East has scored more than 23 points in just one contest and is 1-3 in games decided by 14 points or fewer. Wichita Southeast (2-4) – Tre Griffin leads the City League with 116 carries for 673 yards and Keshaun McGaugh paces Southeast with 56 carries for 330 yards. Southeast opened with four straight losses and then won its last two games with a 14-7 win against Wichita North and a 27-8 victory versus Wichita South. Key Games: (Wk 9) Heights at Derby will decide both spots. Wichita Northwest (2-4) – Northwest has just one game where it has exceeded 16 points. In its four losses, Northwest has just 20 combined points. Erin Gaither has completed 35 of 94 passes for 464 yards and five scores. Haysville Campus (0-6) – John Becker has completed 47 of 123 passes for 534 yards, and Gabe Chavez has hauled in 22 catches for 227 yards. Opponents have outscored Campus 298-54. The Colts have had no game closer than 28 points and lost 70-0 to Maize last week under first-year coach Greg Slade. Wichita North (0-6) – North has only reached double digits in scoring in one game this season -- last week's 46-15 loss at Wichita West. Joe Beldon's team fell just 14-7 to Wichita Southeast the week prior. North has gone just 2-32 since the beginning of the 2010 season. Wichita South (0-6) – Just two years ago, Cory Brack led South to a 4-6 record and the postseason before he took over at Cheney. South slipped back to 1-8 last year and has now lost eight straight contests under second-year coach Kevin Steiner. Two games are within 20 points, but none closer than 17. Dominic Webb has completed 43 of 93 passes for 446 yards and four interceptions. Kyle Wilson has hauled in five catches for 167 yards, a 33.4 average that ranks first in the City League. Key Games: (Wk 7) Campus at Northwest should decide both spots in the weakest’s big-school district. Maize (5-1) – Running back Chase White leads the Eagles with 101 attempts for 1,228 yards, more than twice as many players in AVCTL Division I. Quarterback Connor Lungwitz has completed 73 of 122 passes for 973 yards. Maize is third in Class 6A scoring offense at 253 points. Garden City (4-2) – Garden City has averaged just a shade under 400 yards per game and average 36.3 points per contest behind senior quarterback Greyson Tempel, one of the state’s most dynamic offensive players. Tempel has thrown for 1,110 yards and rushed for a WAC-best 908 yards with 26 total scores (13 rush, 13 pass). Defensively, Nalen Rincones and Cody Worden pace the WAC with 13 tackles for loss. The Buffs stand sixth in Class 6A in scoring offense at 218 points. Dodge City (3-3) – Kelan Newton has completed 88 of 177 passes for 1,010 yards with nine scores against three interceptions. Blaik Middleton paces Dodge City with 507 rushing yards. The Red Demons have outscored opponents 182-133. 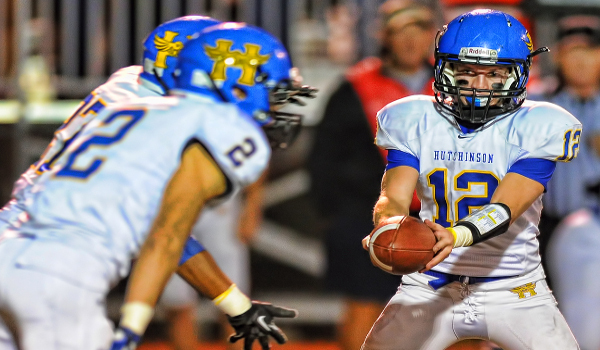 Hutchinson (3-3) – Last Friday, the Salthawks lost their third regular season game for the first time since 1998. Hutchinson has lost the three contests by a combined score of 128-17. Hutchinson has lost nine starters to injury this season and had just 68 yards of total offense in a 36-0 loss to Derby last week. Jacob Hardenburger paces the Salthawks with 92 carries for 667 yards and quarterback Turner Wintz has 71 carries for 571 yards. Wintz didn’t play last Friday because of a concussion and Hardenburger has an injured shoulder, but both are expected to return for district play. Key Games: All games are key in a very strong district. Maize and Garden City have the firepower, the question becomes if Hutchinson is too banged up to reach the postseason?